MINNEAPOLIS — A Minnesota prosecutor directly appealed to Pope Benedict XVI for help Tuesday as she tries to get an Indian priest back to the United States to face sexual assault charges. Roseau County Attorney Lisa Hanson mailed Benedict a letter asking him to intervene in the case of the Rev. Joseph Palanivel Jeyapaul. Jeyapaul is charged with two counts of criminal sexual conduct for the alleged assault of a 14-year-old female parishioner while he served at Blessed Sacrament Catholic Church in Greenbush, Minn., in late 2004. 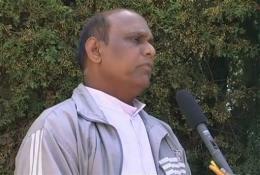 Jeyapaul returned to India before the charges were filed in early 2007, and continues to serve in the Diocese of Ootacamund. He denies the allegations. Asking Benedict to exercise his "supreme, full, immediate, and universal ordinary power" under Canon Law, Hanson wrote that he could expedite Jeyapaul's return and help the state of Minnesota avoid a lengthy extradition process. Jeff Anderson, a St. Paul attorney who is representing Jeyapaul's accuser in a separate civil lawsuit, provided The Associated Press with a copy of the letter. Hanson confirmed Tuesday that she sent the letter but declined further comment. Jeffrey Lena, the Vatican's U.S. attorney, said the appeal for papal intervention was inappropriate. "This is a civil matter concerning an extradition treaty between the United States and the Republic of India," Lena said. "Given that the Government of India does not appear to have received any extradition request from the United States in the last three years, the prosecutor's immediate release of a letter written directly to the pope smacks of a publicity stunt rather than a legitimate attempt to secure the priest's return for prosecution." Hanson has said her office filed an extradition request with the Department of Justice last fall; she said department officials warned her it could take as long as four to five years if Jeyapaul decides to fight it. The Vatican said last week that officials thought Jeyapaul should be defrocked, but church law left the decision to his bishop in India. Jeyapaul came to Minnesota in 2004, and was assigned to the church in Greenbush, just south of the Canadian border. In early 2005 he returned to India to visit his ailing mother; while he was there, allegations came to the attention of Diocese of Crookston officials that he had an inappropriate relationship with a 16-year-old girl. Crookston Bishop Victor Balke contacted Jeyapaul in India and told him not to return to the diocese or he would go to the police. It was more than a year later that Jeyapaul was charged with assaulting the younger teenage girl. Balke had raised concerns about Jeyapaul's continued service to the church in letters to several top Vatican officials. The Most Rev. A. Almaraj, the bishop of the Diocese of Ootacamund, held a canonical trial and sentenced Jeyapaul to a year in a monastery. Almaraj said he couldn't do more unless Jeyapaul's guilt was proved, and the 55-year-old priest now works in the bishop's office handling paperwork for schools. Hanson wrote to Benedict that facilitating Jeyapaul's return to Minnesota would "send an unequivocal message to the world that the church has finally cast off the shroud of secrecy that has surrounded sexual abuse of children by the clergy for years."